You know whenever I see the word “Chicago” on a restaurant I take that as a challenge. 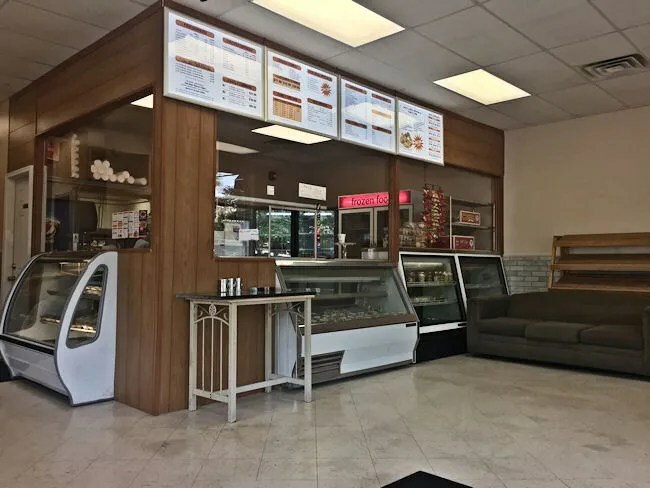 Having grown up near Chicago, I’m a little overprotective of places trying to replicate Chicago style food without actually knowing what it is. You native Michiganders know what I’m talking about…Coney Dogs…right? A hot dog with chili on is not necessarily a Coney Dog. That’s how I feel about “Chicago” food. A few weeks ago, I noticed new signs go up on the corner storefront of the North Point Community Retail Park in Kalamazoo’s Northside Neighborhood. 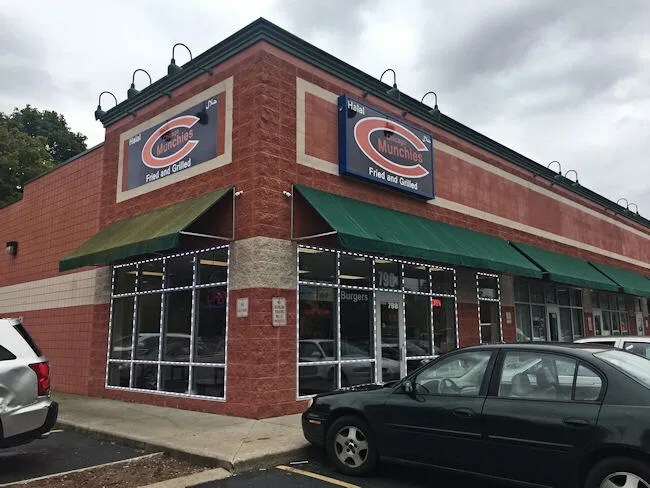 Not only did they use the word Chicago but they stole the Chicago Bears “C” logo to drive home the point. 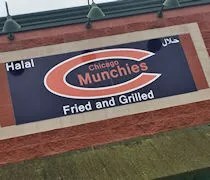 The store is called Chicago Munchies Fried & Grilled. It’s on North Westnedge near West Frank Street. The small corner shop has been many things over the years. It was Sailors Fish & Chicken at one time. It was TNT – A Touch of Soul a few years back. Most recently, it was called Pharaoh’s Valley. I did something I don’t normally do when I write these blogs. I went there for lunch two days in a row. I was intrigued on the first visit and I didn’t think that was enough to write about. I knew I was going to go back, so I just did it the next day so I could expand the blog post a little more. The first day I stopped in was a Thursday afternoon for lunch. The first thing I noticed was how much the place was cleaned up. I had visited this shop when it was TNT and when it was Pharaoh’s Valley. Both times it was pretty bare. It wasn’t dirty to where I’d be worried about eating there, but you could tell the previous tenants weren’t super worried about how the place presented itself. The order counter is connected to the kitchen and both are separated from the dining room by glass. There are windows that can be opened so you’re not talking through the glass like you do in some Chicago neighborhoods. The menu board hung above the order window, but the cashier handed me a paper menu so I wouldn’t have to strain my neck looking up. There is a small dining area on the other side of the space. There are four booths lined up against the window and there are a couple of pub tables near the entrance. There’s a TV that was turned to CNN that was way too loud for the space, but I was the only one there and I was just waiting. There was a steady line of people moving through picking up call ahead orders as I waited for my number to be called. The first day I stopped for lunch I was in the mood for something fried. I was actually in the mood for chicken so I ordered the 6 Piece Wing Dinner. The dinners all come with fries, bread, coleslaw, and a drink and the six piece dinner set me back a little over $8. I believe they take credit cards, but there was sign saying their machine was down so I paid cash. It took a little over ten minutes for my chicken to be cooked and when my number was called, I was handed a Pepsi to go along with the food. I started with the fries on my way back to the office just because that is something easy to eat in the car. The fries were very crispy, but they were typical restaurant fries with not a lot of seasoning. They’re good filler but nothing to write home about. They have salt, pepper, and their lemon pepper seasoning in shakers next to the order area so you can put more on before you leave. I started to then just kinda passed when I saw the chicken thinking some of the chicken seasoning would rub off. When I got to a place where I could eat, I started breaking the wings apart. They weren’t very big, but they were very tender and juicy. The chicken had a nice crispy breading that was covered in a lemon pepper seasoning. It’s not quite “crack chicken” but it’s got a lot of the same properties with a little bit less sugar. This seasoning is more of a tart, salty seasoning that didn’t dry your mouth out the way the “crack” seasoning does. Day two was a Friday and I went in around noon. Again, I was the only one in the place to order. There were several people that came through to pick up call ahead’s which I should have done myself but didn’t think about it. I went back for a round two because I wanted to try the Italian beef. I’m going to be honest, I had very, very low expectations for this. 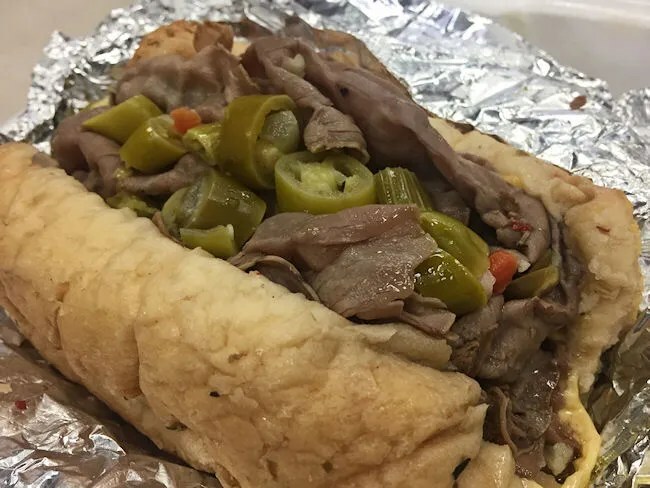 I’m a snob when it comes to Italian beef and I hate places that throw some frozen roast beef on to a bun and call it an “Authentic” Italian beef. Like the chicken dinners, the sandwiches come with fries and a drink. Again, this set me back a little over $8 and the credit card machines were still not working so I paid cash. It took a little less than ten minutes for my number to be called. 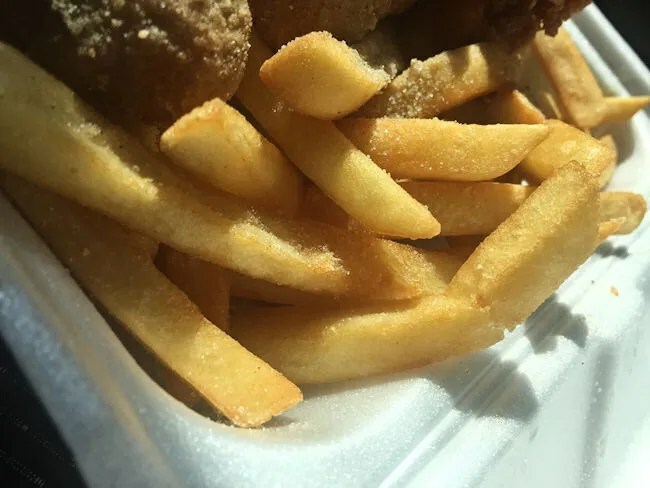 I grabbed the box and added some salt to the fries then grabbed my Pepsi. I ate the fries on the way back to the office again. They were the same as the day before but with a little more salt and pepper on them this time. 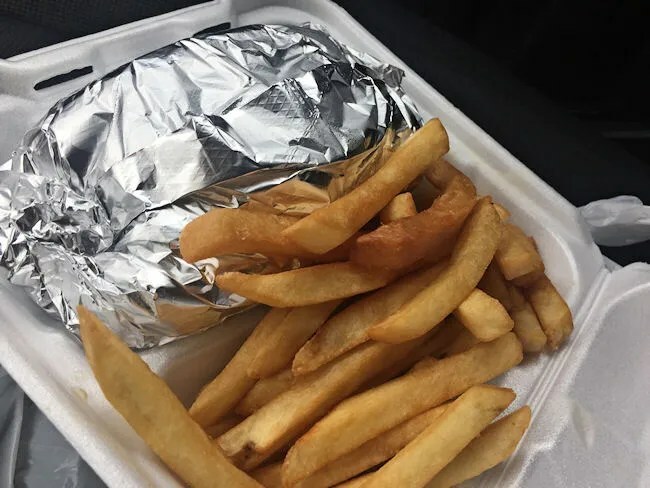 The Italian beef was wrapped up tightly in aluminum foil waiting for me to get to a safe place to eat it. When I ordered the beef, I didn’t give them any instructions on how I wanted it. In Chicago, I would order it “hot and juicy” which means I want hot peppers and the bread dipped and soaked in the gravy. I was actually really curious how they would make this without me saying anything. The beef was clearly pre-packaged beef and it was a little bit tough like it had been sitting too long. It had a good flavor to it though. The sandwich was topped with hot giardiniera and there was even some cheese in the bottom of the bread. The bun had soaked up some of the gravy but I’m thinking that it was from when the meat was put on it. I didn’t fall apart like it had been dipped. It was an alright Italian beef sandwich and the parts of the sandwich held up to a true Chicago style beef. If I was in Chicago, I would be disappointed, but being in Michigan, it’s a sandwich I will be going back for. It’s close enough and we don’t have a lot of Italian beef choices in this part of the world. 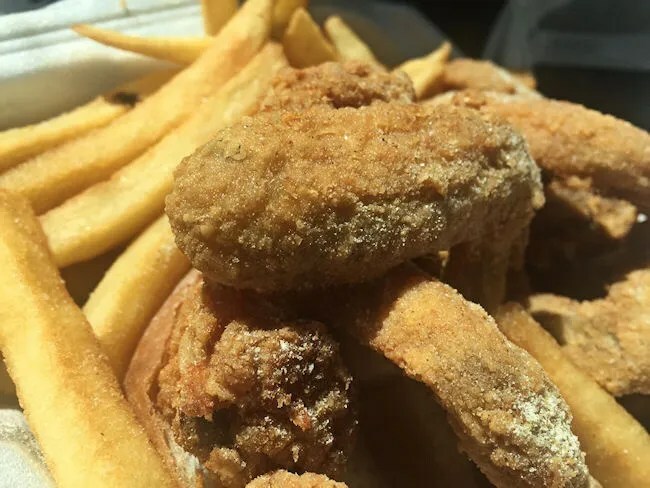 Chicago Munchies Fried & Grilled is really good for what it is. 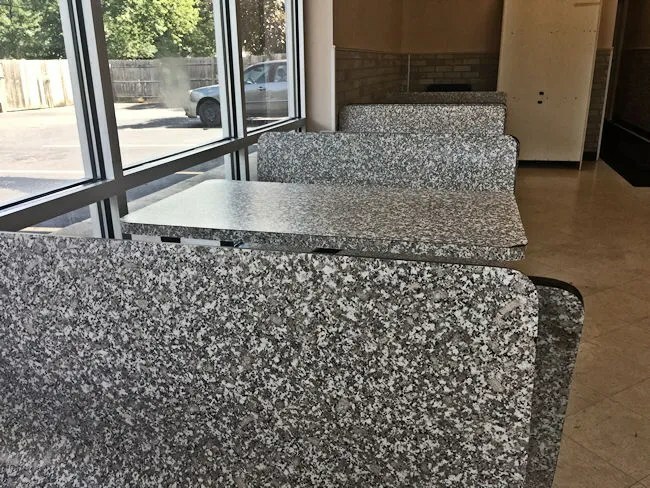 A neighborhood quick service restaurant. There are not enough places like this in the area and even though I’m not a fish eater, I know there aren’t a lot of places in Kalamazoo to get fish. 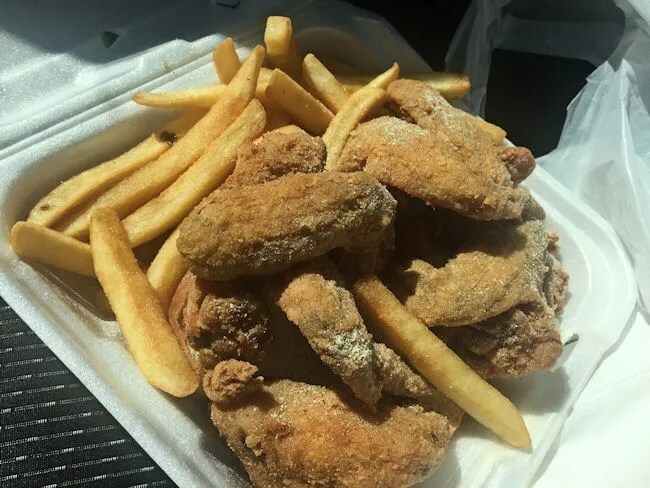 Chicago Munchies offers that as well as chicken wings, buffalo wings, chicken gizzards, and a number of sandwiches including Philly’s and gyros. They’re open late on Friday and Saturday nights and they offer a place to get good, greasy food whenever you’re in the mood. The food was disgusting. I was looking for a good spot with good food, this is not the spot. 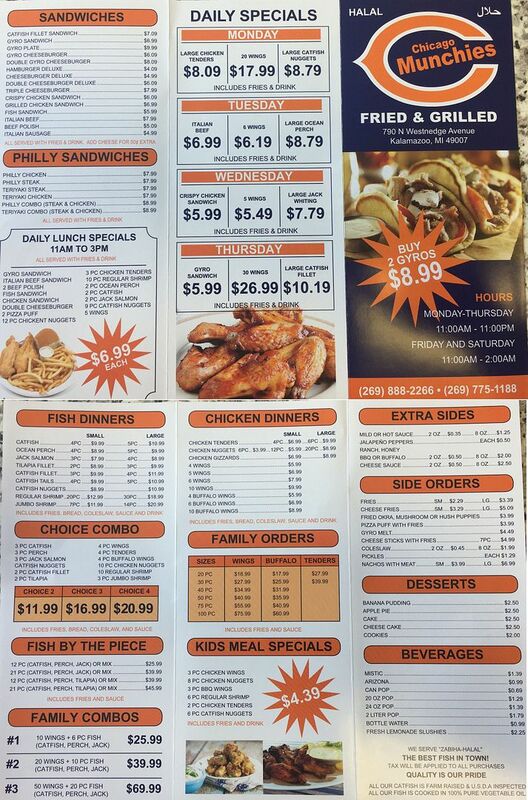 Better off going to and sticking with Fish Express. I miss Detroit food. Can’t wait to get to Coney Island.